Sweetcream Dairy pays tribute to nearby businesses with a unique product line influenced by a pizza shop, a bakery, a brewer, a diner, a bookseller and more. 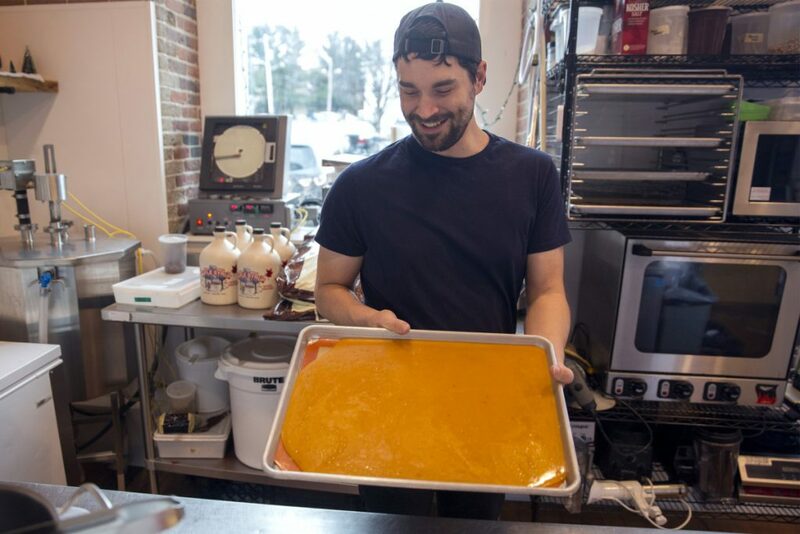 BIDDEFORD — When Jonathan Denton of Sweetcream Dairy decided to partner with local businesses to create unique ice cream flavors, featuring his favorite butter cookie from Reilly’s Bakery was a no-brainer. But an ice cream flavor inspired by the iconic Pizza by Alex? That took a little more imagination. The result is a toasted cheddar ice cream with pepperoni toffee, one of 10 flavors that Sweetcream Dairy will release in limited supply starting Friday. Each flavor was developed in tandem with a small-business owner to showcase the city’s food scene. 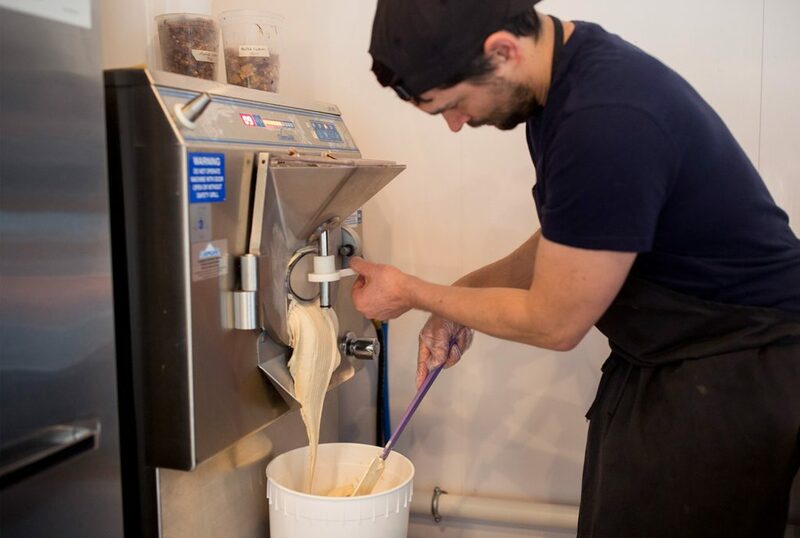 Denton, who owns Sweetcream Dairy with Jacqui DeFranca, had been running his ice cream shop on the Pepperell Mill Campus for a year when he decided he wanted to collaborate with his business neighbors to create new flavors. But the timing wasn’t right until now, when the busy summer season is over and there’s more time to experiment. Sweetcream Dairy co-owners Jonathan Denton and Jacqui DeFranca prepare their Banded Brewing collaboration ice cream Wednesday. The 10 flavors inspired by Biddeford businesses will debut Friday. In the past few years, as storefronts are repaired and mills are renovated, new restaurants and food shops have opened in the city’s downtown. The newcomers join longtime favorites like Pizza by Alex and Reilly’s Bakery to create a growing and diverse food scene. The Palace Diner and Elda have each recently received national attention for their food. Denton, 33, grew up in Biddeford and moved home from New York with DeFranca to open Sweetcream Dairy two years ago. They were happy, of course, to join the longtime restaurants where he grew up eating, but also were energized by the new ones opening around them. They’ve already done special flavors with Banded Brewing and Biscuits & Co., and had no trouble convincing other restaurants to team up with them for this project. Don Lindgren, an antique bookseller with Rabelais, already was a fan of Sweetcream Dairy before Denton approached him about the collaboration. Lindgren turned to his antique cookbooks for inspiration. He found it in the 1770 book “The Court and Country Confectioner” by an author known as Mr. Borella, who was a confectioner for the Spanish ambassador in England. The book, published in London, was the first cookbook to contain a chapter dedicated to ice cream, Lindgren said. Jonathan Denton makes the Banded Brewing ice cream Wednesday. The malt-based ice cream will have malted cookie crumbles, wheat berries and two kinds of chocolate chips. Lindgren was intrigued by the recipe for brown bread ice cream, which he said became a classic flavor that has been popular at various times over the past 300 years. The same book featured recipes for ices made with unusual flavors, including elderflowers, jasmine, white coffee, tea, pineapple and barberries. 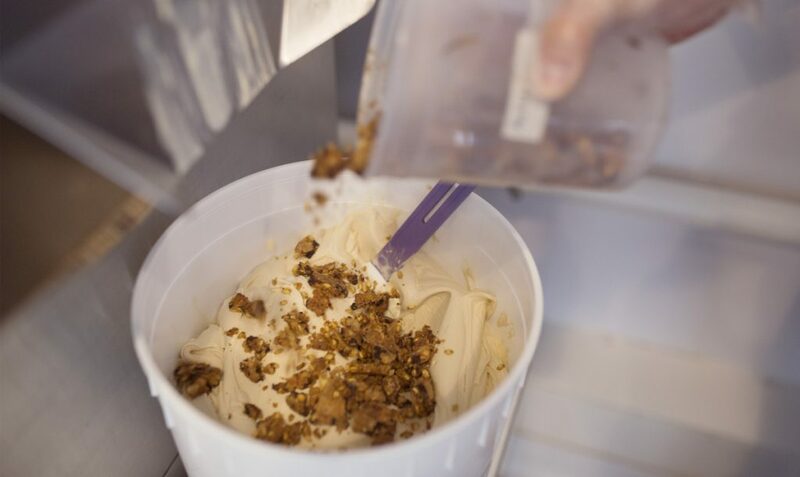 To create a flavor inspired by the historic brown bread ice cream recipe, Denton made a brown sugar rum base and turned to another Biddeford business, Night Moves Bakery, for a Baltic rye. He grated the bread, toasted the crumbs and mixed it into the base. “One of the things that struck me right away is this flavor is in the same school with grape-nut ice cream, which is an old New England favorite,” he said. Elizabeth Hussey, the fourth-generation owner of Reilly’s Bakery, is eagerly awaiting the chance to taste the final version of the butter cookie ice cream, which Denton says has a taste reminiscent of cake batter. The butter cookies have been on the Reilly’s menu for as long as Hussey remembers. Cookie crumbles made with the Banded Brewing Co. malt are poured into ice cream at the shop Wednesday. Denton grew up eating pizza from Alex’s – like a true native he’s been known to order his pizza cooked in the “old oven” – and was intrigued by the idea of creating a pizza-inspired ice cream. It was not hard to convince Steph Mantis, whose father, Andy, owns the pizza shop founded in 1960, to go along with the idea. She enthusiastically provided samples of their secret spice blend, cheese and pepperoni, and has brainstormed ideas for how to incorporate the flavors into a frozen treat. 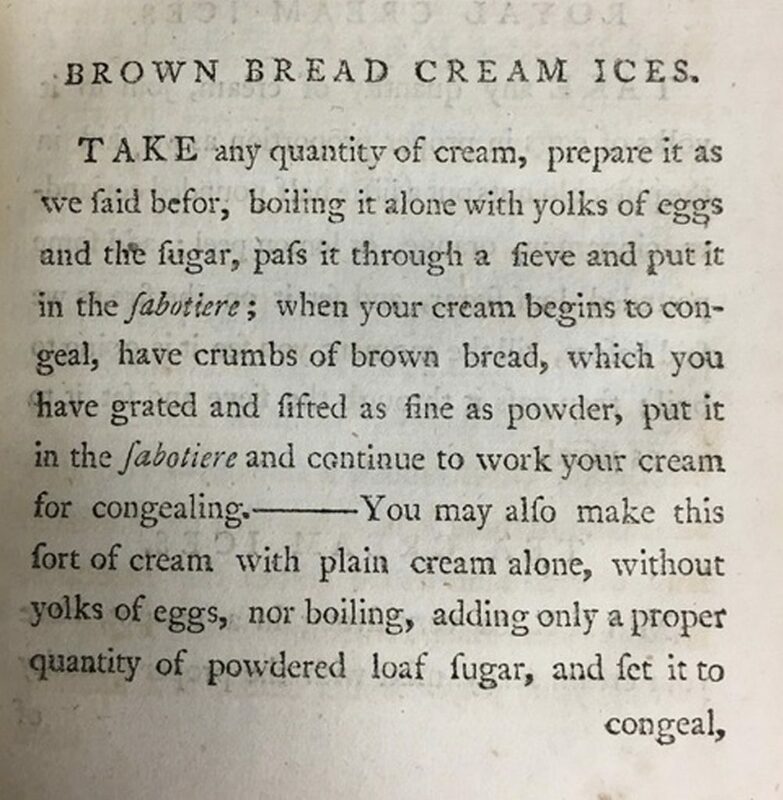 The recipe from a 1770 cookbook inspired Sweetcream’s brown bread ice cream. “Why not combine two things people love? There’s not a much better or weirder combination,” Mantis said. A few days before the launch of the new collection, Denton was still tinkering with some of the flavors, including one with the Palace Diner that will be heavy on the egg flavor. Sweetcream’s other special flavors will include a black sesame ice cream developed with Bowman Brown, the chef/owner of Elda; a flavor developed with Banded Brewing that includes malted wheat berries; a tart cream-cheese ice cream with everything-bagel seasoning sprinkled on top, inspired by Rover Wood Fired Bagels and Pizza; and a lime gimlet sherbet made with the owners of Round Turn Distilling. DeFranca is certain the flavor they made with Elements, a popular coffee/books/beer shop, will be a customer favorite. Elements recently started roasting its own coffee beans, so the ice cream is made with the medium roast and blended with their gluten-free brownies. The new collection will be sold at Sweetcream Dairy starting Friday and available for a limited time. CORRECTION: This story was updated at 4 p.m. Thursday, Nov. 29, 2018, to correct the spelling of Steph Mantis’s name.